Townsend Duryea was born 1823, Glencoe, Long Island, New York. His father was Hewlett Duryea (b.1795) and his brother was Sanford Duryea (b 1833). It seems to have been a large family circle (1850 Census). Townsend trained first as a mining engineer, but quickly moved around 1840 to the arts and photography. In mid 1852 Duryea applied for a patent #9018 Townsend Duryea, Williamsburg, Kings Co., machine for polishing daguerreotype-plates, 6/15/1852. Later in 1852, he moved to Melbourne, Australia, already a professional photographer. Here he established a studio in partnership with Archibald McDonald, McDonald & Duryea, first in Bourke St East then in Collins St West. Duryea & McDonald exhibited daguerrean portraits and views at the 1854 Melbourne Exhibition. Duryea & McDonald established the Skylight Gallery in Yarra Street Geelong (1853- 1855). 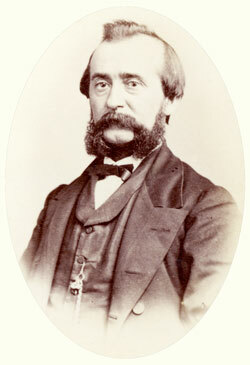 Charles Nettleton was one of their assistant during this period. Duryea & McDonald also operated in Tasmania in 1854-1855. They established a (daguerreotypists) studio in Liverpool St, Hobart in late 1854. They toured northern Tasmania making ambrotypes portraits and views during 1854-55. It seems that during their work in Tasmania the partnership was dissolved. Their hobart studio was then occupied by the photographer, Alfred Bock. McDonald continued the mainland studio, with Nettleton concentrating on views and Macdonald on the studio work. In 1855 Duryea moved to Adelaide and in February opened daguerreotype rooms over Prince's store at the corner of King William and Grenfell Streets. Later that year, Townsend and his brother, Sanford, established a studio under the business name of The Duryea Brothers, 66 & 68 King William Street Adelaide. The studio was owned by Alexander Hay MP. Hay was a wealthy businessman, a large land owner in and around the city, and a member of the colony’s first Parliament. (Anthony Laube - paper for 2005 History Trust of SA's Duryea Conference). At first they produced Daguerreotypes but soon entered the collodin trade and advertised 'all the new Processes on Glass and Paper'. Duryea produced Crayon Photographs and advertised this process and caused a little controversy and public debate particular with his competitors. The Duryeas are reported as being the first photographers to have worked outside Adelaide. As travelling photographers in 1856, they visited Auburn, Burra, Clare, Kapunda, Strathalbyn, Mt barker, Goolwa, Milang, Port Elliot and their near-by towns. The brothers' business lasted till 1857, when Sanford moved to Perth and established his own studio. He married in 1858. Townsend Duryea entered a new photographic partnership at 68 King William Street, under the name Nixon & Duryea (William Nixon and Townsend Duryea). Sanford returned to Adelaide late in 1859 and they re-established the partnership, although under Townsend's name - not the former 'Duryea Brothers', till this was dissolved in 1863. From 1863 to 1875, Townsend Duryea operated his successful own studio on the corner of William and Grenfell Streets Adelaide. Duryea had other interests. In 1857 he built a thirty-foot cutter, the Coquette, behind the Maid and Magpie Hotel in Magill. Though the cutter was said to be for the River Murray trade, it was mainly used for racing; with bets reported to be as high as £100. Another of his interest was mining, with holdings in and around Wallaroo. By 1861, Duryea Mining Association was reported as owning fifteen mining sections in the area. Around 1862-63, Duryea advertised that his studio was now offering the 'new' style cartes des visite. His photographer's imprint on the reverse of these cards changes over the next decade. He published landscape photographs in the carte des visite format. In the beginning of 1864, Duryea advertised that he was offering sennotypes, later as life-size sennotypes using Woodward's patent solar camera. He also hired an artist from England to do his oil and water colour portraits and to colour the sennotypes. The stuio was improved with better lighting. All of this can be seen in a picture page.59 of the Mechanical Eye, where the studio has been photographed from across the street. The name of the studio is clear, 'Duryea Photographic Gallery', an advertisment for 'Life Size Sennotypes, and the solar camera can be seen protruding from the corner window. According to Bob Noye, Duryea specialised in gem portraits, adhesive back miniatures used instead of signatures - sold at the attractive price of 100 for 50 shillings. In 1866, he published Duryea's Adelaide Album, with seven street scenes and a photograph of drawing. This was accompanied with a gem portrait of Duryea instead of his signature. The National Library of Australia has a copy of the album. Duryea had become part of Adelaide's elite, a mixed group based on the model of the English aristocracy, but with many amongst them having moved up the financial and social ladder in recent years. The Adelaide elite, governors, visiting dignitaries and the city's leading citizens, clergy, army officers and high ranking civil servants were the subject of many of his studio portraits. In a set of albums owned by the family of the then Chief Justice of SA, the Hanson Albums, Duryea and some of his family are placed as friends of the family. In 1865, Duryea produced the now famous panorama of Adelaide. His was not the first to produce a panorama of Adelaide, but it was the most successful. Duryea climbed the scaffolding around the new Post Office tower and from here took fourteen 10" x 12" plates. He began in the morning, facing north, and worked his way around the tower in an anti-clockwise direction to avoid the sun shining into his camera lens. The resultant panorama is 4.3 metres in length and remains much celebrated in Adelaide today and on a special web site. When Queen Victoria's son Alfred, Duke of Edinburgh visited Adelaide in 1867, he chose Duryea to be his official photographer. Hence the change in his label on the back of his cartes-de-visite from this period. On 9th November, the Duke posed at Duryea's King William Studio for the first royal portraits made in Australia. Duryea then accompanied the Duke and the official party on the visit, travelling in a specially prepared photographer's van. The Royal portrait was very popular and was reproduced in the Illustrated London News. Duryea also produced Mosaics of 'important' people of the colony. See the link for more on the mosaics. Duryea made a giant mosaic in 1871 of 520 men attending a banquet given in Adelaide by the merchant E. Solomon. (Shades of Light). In 1872 he photographed almost all the old surviving colonists, making a mosaic of 675 cartes de visite. In 1868, he won a medal for his exhibit at the South Australian Agricultural and Horticultural Society show. In 1868, a prize at the Society of Arts and a medal at the 1867 Paris Universal Exhibition. Duryea's panoramas, royal portraits and the exhibition prizes made him famous and more successful. Duryea also benefited from employing skilled operators. He was a short man, but was extremely energetic, having a vigorous mind and keen intellect. He was an entrepreneur and made full use of advertising in newspapers and almanacs. In 1875 a spectacular fire destroyed both the studio and Duryea’s entire collection of 50,000 glass plate negatives. One of the best records of early Adelaide was lost. While the studio was being rebuilt, Duryea continued business from a second studio at The Adelaide School of Photography in Rundle Street. Duryea offered to redo photographs for his customers. Duryea soon sold the business to Nixon and left Adelaide. He gave up professional photography and took up farming near Yanga Lake in the Riverina area of south-west New South Wales. In his later years, he suffered a stroke which largely crippled him, leaving him an invalid. On 13 December 1888, he died as a result of a buggy accident and was buried at Parkside near Balranald. Besides four of his sons who went on to become photographers, having been taught by their father, several others who worked in his studio had successful careers in photography. These included Nicholas Caire, Henry Jones and John Hood. The story of the camera in Australia. Cato, Jack (1955) Melbourne: Institute of Australian Photographers. and many little snippets found on the www.